Truck manufacturer Volvo Group Australia has announced it will upgrade its current truck plant in Wacol, Brisbane. The news was announced at the launch of the company’s $30 million Australian headquarters and Brisbane south dealership. The new headquarters houses offices, a dealership dedicated to Volvo, Mack and UD trucks, which all had models on display and a 33,000 square metre workshop at the new Metroplex Westgate business park. It features a Leonardo Di Vinci-inspired helix central staircase made of muted Scandinavian timber and a seven-metre glass hangar door inside a 12.5 metres high atrium to accommodate the display of heavy vehicles. The company employs more than 1500 employees around Australia and has produced more than 60,000 trucks from its Wacol factory since 1972 when it first began manufacturing in Queensland. Volvo Group international President and CEO Martin Lundstedt said the refurbishment of the nearby Wacol truck plant attests to the strong outlook of the company as it ramps up production. “Our increase in market share towards 27 per cent over the past five years in combination with a strong heavy-duty truck market, makes it necessary to further increase our production capacity,” he said. Mr Lundstedt said the investment in the new Wacol facility will provide a boost to its 85 local component suppliers. 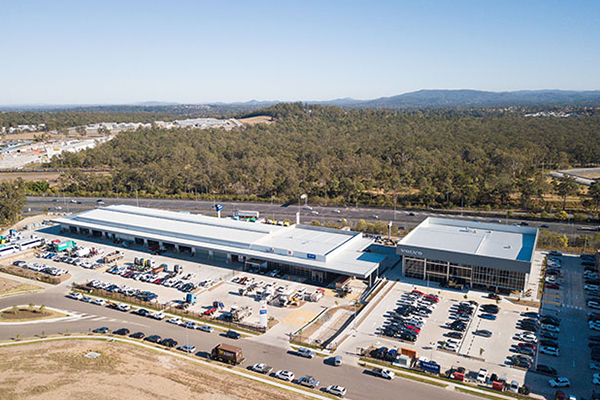 Queensland Premier Annastacia Palaszczuk welcomed the announcement at the opening of the new facility, which employs 500 workers and is a significant part of the state’s manufacturing base. “Volvo Group is the only truck manufacturer to be awarded ‘Australian Made’ certification, and we’re particularly proud to call them Queensland-made,” Ms Palaszczuk said. Outgoing Volvo Group Australia President Peter Voorhoeve said the building housed 200 staff. “It’s a beautiful building but more than that it’s a tangible demonstration of Volvo Group’s commitment to its future operations in Australia,” he said.